26 December 1843 at Queen Street, Wolverhampton, the second of 13 children born to Walter Swift Evans and his wife, Sophia (nee Spilsbury). His father, Walter Swift Evans, was also an artist who utilised his creative abilities in a professional capacity, working as an engraver on gold and silver, a copper plate engraver and a master church furniture maker; he was associated with Pugin in the revival of mediaeval architecture. His working life was spent in and around Birmingham. Bernard Evans studied painting in Birmingham from the age of 7, under the direction of Samuel Lines, William Wallis and Edward Watson. He married Mary Ann Eliza Hollyer at St Luke's, Kentish Town in London on 2 August 1870. His wife was the daughter of Samuel and Mary Ann Eliza Hollyer; her father was an engraver, her brother, Frederick Hollyer, was a pioneer in the use of photography for reproducing works of art. Evans was a prolific painter of landscapes, in both oil and watercolour, most frequently depicting scenes in the Midlands, Yorkshire and North Wales, where he became one of the 'first thirty one' founder members of the Royal Cambrian Academy in 1882. 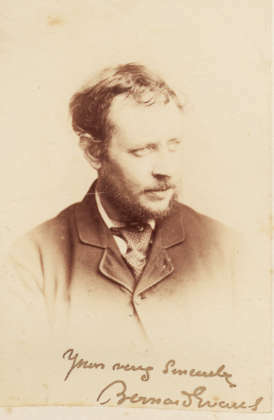 He exhibited numerous times throughout the British Isles and abroad; his first works were exhibited in 1864 at the Royal Birmingham Society of Artists. From 1870 he exhibited at the Royal Academy on 13 occasions and 68 times at the Royal Society of British Artists, Suffolk Street, London. In 1880, whilst still living in London, Evans was a driving force behind the creation of the City of London Society of Artists and in 1881 he was elected a member of the Savage Club. He was also a member of the Society of Artists which met at Langham Chambers, where groups of artists produced the popular 'Langham Club' sketches. The Evans moved to Harrogate in the late 1880s and continued to live at 20 Park Parade until about 1911, although they spent several winters during the late 1890s on the French Riviera; paintings of Cannes and the surrounding area can be seen online. Bernard Evans died on 26 February 1922 in London. An entry in the Times for Tuesday 28 February 1922 reads: EVANS - Sunday, the 26th Feb., passed peacefully away, at the home of his niece. BERNARD WALTER EVANS, R.I. aged 79. Funeral at Harrogate, Thursday. His obituary appeared in the Harrogate Advertiser on Saturday 4 March 1922. He was buried with his wife, who had died in 1902. The scene represents a view of Bolton Abbey from the Soay above the Skippers Wheel. ​On a similar theme Evans also painted Fountains Abbey and Ryland Abbey.